The 2007 BCAA corporate calendar lists the goals for the various corporate sectors, and compares the past year’s achievements to the stated goals. We needed to link the corporate section with the monthly calendar section to help illustrate those goals. The front half is kept clean and accessible, and easily relatable to previous years’ reports. 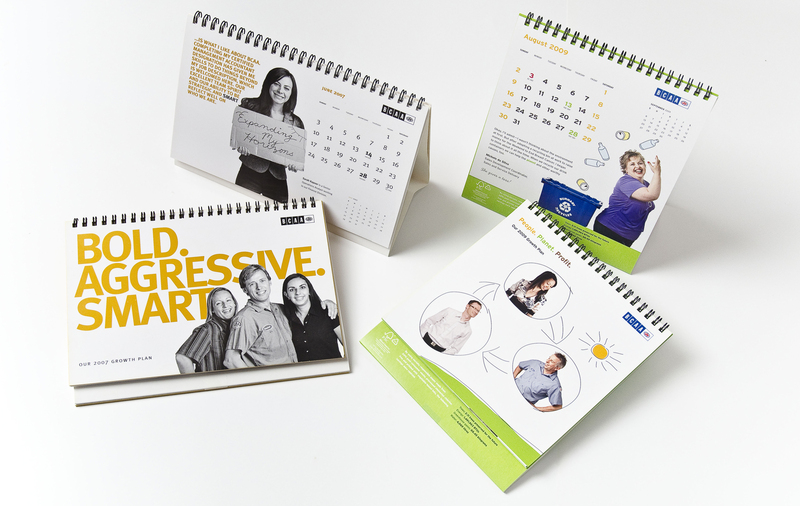 The other half of the calendar features employees who tell their story and how they achieved their departmental goals. We used the idea of hitchhiking across BC as the thematic device for the portraits. Each person wrote out their own sign and with the help of an encouraging photographer they managed to get quite animated to illustrate their stated goals or achievements.